Possibly the most undignified musical instrument ever, hipDisk exploits changing relationships between torso and hip to actuate sound. Simple horizontal disk-shaped extensions of the body exaggerate, so make highly visible, the interdependent relationship of the hip and torso. Soft switches, strategically placed around the perimeter of each disk, allow the wearer to play a chromatic scale, and so play simple melodies, restricted only by flexibility and speed of swing. hipDisk is designed to inspire people to swing their hips and explore and extend the full range of movement available to them through a simultaneous, interdependent exploration of sound. In creating hipDisk, the interest was to move beyond limb- and digit-triggered switches and explore full-body movement for actuation. The resulting body-instrument interconnects choreography and composition in a fundamental way, and hopefully opens up new areas of exploration. hipDisk was worn by Red Symons for his ABC774 radio morning show on 1 august 2011 and won the ABC TV’s New Inventors program, episode 22, 2011, making it a finalist in the Invention of the Year competition! hipDisk participatory exhibit – People wearing the disks for the first time. ABCTV New Inventors’ judges play. Wilde, D. hipDisk: using sound to encourage physical extension, exploring humour in interface design. International Journal of Performing Arts and Digital Media (IJPADM). Intellect (UK) 2008. Wilde, D.hipDisk – a most undignified musical instrumentIn proceedings of (re)Actor2, the Second International Conference on Digital Live Art 2007, Leeds, UK. 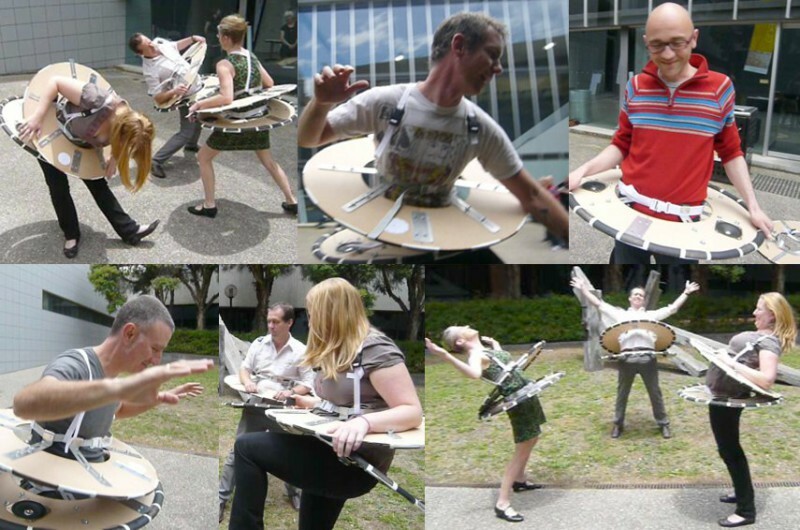 Wilde, D.hipDisk – an interactive sonic system inspired by core-body gesture In proceedings of the Australasian Computer Music Conference 2007 (acmc07), Canberra Australia. hipDisk was conceived and developed during Reskin, ANAT and Craft Australia’s three-week summer residential lab focused on wearable technology. Special thanks to Tony Gargette and Brendan d’Arcy at CSIRO and to Michael Borthwick for additional technical support.